My heart is breaking today. St. John, my favourite island in the world, has endured a brutal battering by Hurricane Irma. I wrote the following article about a week before the storm, after my stay there in July. That was probably my ninth visit to St. John over the years, and I fall a little more in love with it every time I go. 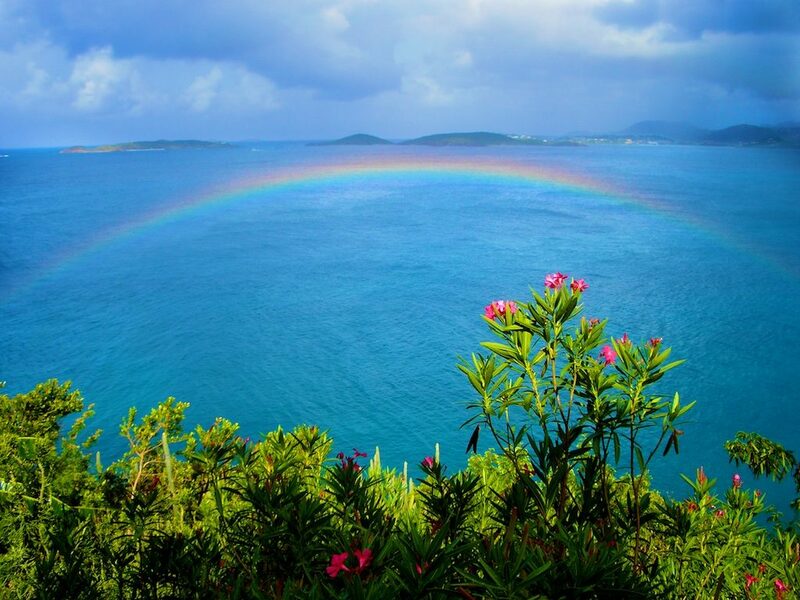 A rainbow over the coast off St. John. These folks are a resilient bunch, and they will pull together to help each other through the worst. 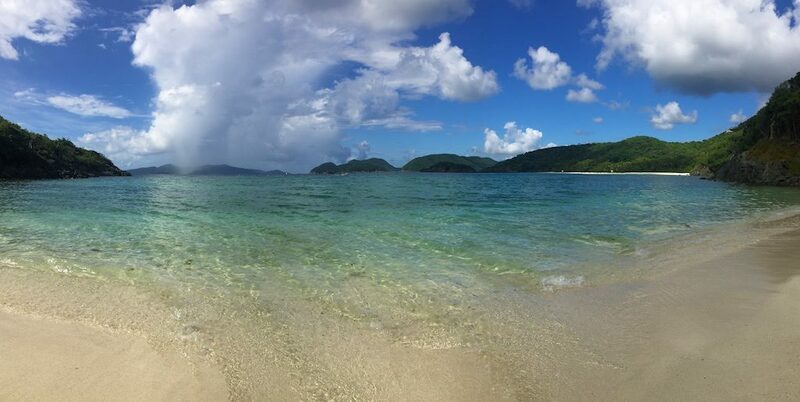 They don’t call St. John “Love City” for nothing! But they urgently need all the help they can get. At the end of this article, you’ll find more information about how you can donate funds or volunteer, as well as sites where you can search for news of friends and loved ones in the path of the hurricane. I’m posting the story below, with photos from my previous visits, as a salute to the people of St. John, and to the island that has lured me with its siren call again and again. Read on to discover why I will be back…and why so many who visit here choose to never leave. 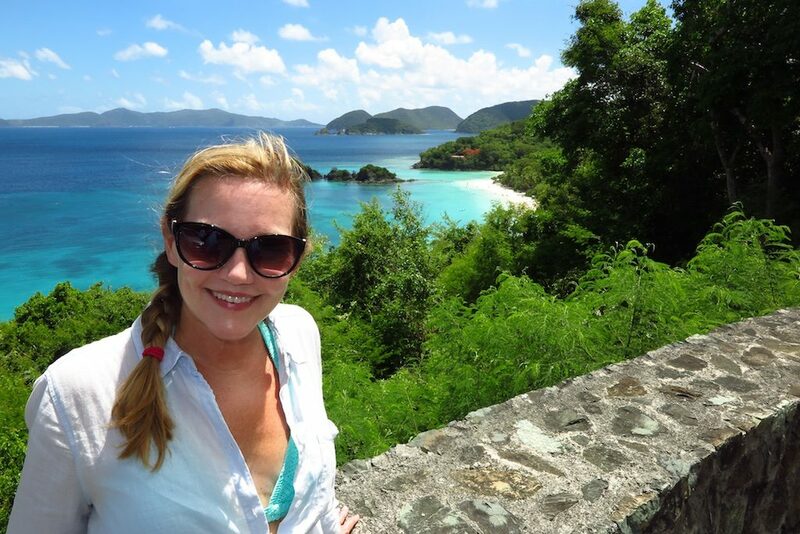 Me in my happy place, overlooking Trunk Bay on St. John. Some sojourns seem designed specifically for 21st Century social media consumption. Duck-lipped selfie with the Mona Lisa? Mais, bien sûr! Piccie of the Leaning Tower of Pisa supported by one carefully placed finger? Perfecto. Instagram of an Egyptian pyramid in the palm of your hand? Absolutely. Then there are those rare holiday havens that feel less like fleeting, frenzied snap-and-go destinations… and more like destiny. The most magical places aren’t about bagging bragging rights; they’re about feeding a hungry hole in your soul. Amy Laughinghouse, September 8, 2017. 1 Comment on A Love Letter to St. John, USVI. Category: Caribbean, Islands and Beaches, United States. Tagged: Caribbean, Hurricane Irma, St. John, travel, United States Virgin Islands, US Virgin Islands, USVI. On my way to breakfast my first morning at St. John’s Caneel Bay resort, I pass several wide-eyed deer, an iguana basking in the sultry Caribbean sun, and a herd of donkeys, casually scratching their backsides on the trunks of palm trees. But something’s missing here. There’s not another human being in sight. 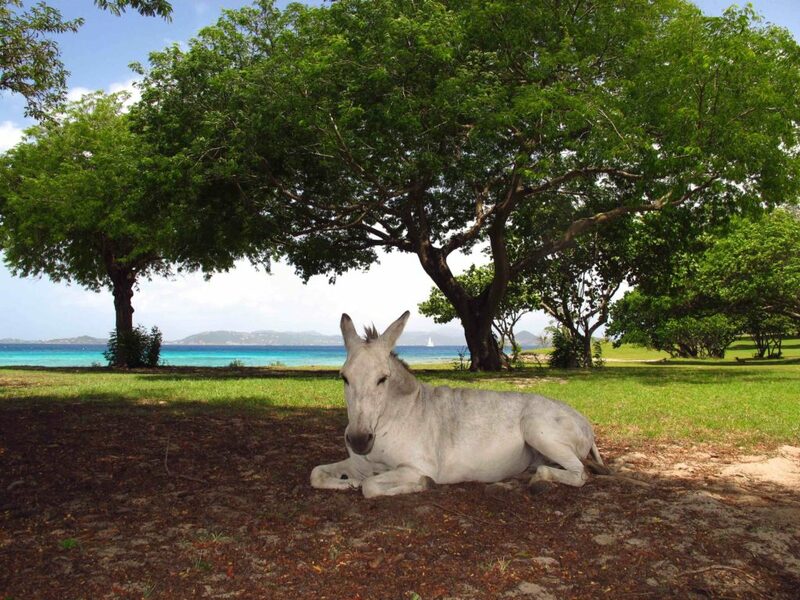 Not quite a unicorn, as he’s missing a horn, but this donkey, resting in the shade at Caneel Bay Resort on St. John, embodies the island’s laid-back spirit. Just as a vague sense of panic sets in—have I missed the Rapture?—I near the waterfront breakfast pavilion, where I catch a reassuring whiff of bacon. So unless Noah’s menagerie has learned to use opposable thumbs and toss a skillet—or a wayward boar has spent too much time tanning in the sun–I’m relatively certain there are at least a few lost souls lingering about. 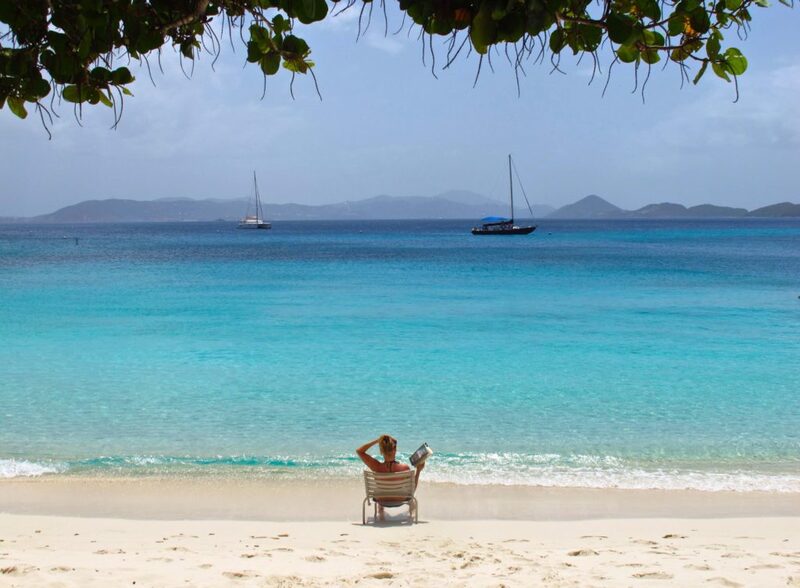 On St. John, there’s time to relax and unwind with a good book. If a haven of such solitude seems improbable in the ever-popular Caribbean, consider this. More than half of St. John is devoted to national parklands, making it arguably the wildest and most pristine of the U.S. Virgin Islands. St. John encompasses only two actual towns: Coral Bay, a quiet crossroads centered around a harbor where sailboats bob in sapphire-blue waters, and its brasher, bolder sister, Cruz Bay. Yet even Cruz Bay, the main port, hardly signifies as a big city, with free-range hens shepherding their chicks along a spaghetti-like labyrinth of roads. But don’t imagine for a minute that being swaddled in the bosom of Mother Nature is boring—because this hot mama also knows how to party. I’ve visited more than half a dozen times in ten years, and I’ve always found something new to entertain me. Amy Laughinghouse, October 13, 2016. 3 Comments on St. John: The Wild Child of the Caribbean . Category: Caribbean, Islands and Beaches, United States. Tagged: Caribbean, St. John, travel, US Virgin Islands, USVI, Virgin Islands.